We all were stoked for this trip. Carrying memories from past VOC trips in our hearts and loving the adventure, friendship and craziness encountered in these trips, we were hoping to continue that VOC story over here in Europe. It was great that so many ex-VOC members traveled far for this trip. Isabel and Frank arrived from Germany, Fangwen traveled from Vienna and Tobias, Pascal, Markus, Diego and me came from different parts of Switzerland. The eight of us met early Saturday at Sisikon train station. At least that was the plan, but because it was that early only six of us met there. There was Markus having troubles with his car and me sleeping comfortably in my cozy bed not hearing the alarm clock. So the six early birds took the bus to Riemenstalden and started their trip to Lidernen Hut hoping the missing two would catch up by taking the gondola (yes there is a gondola. This is Europe, after all). 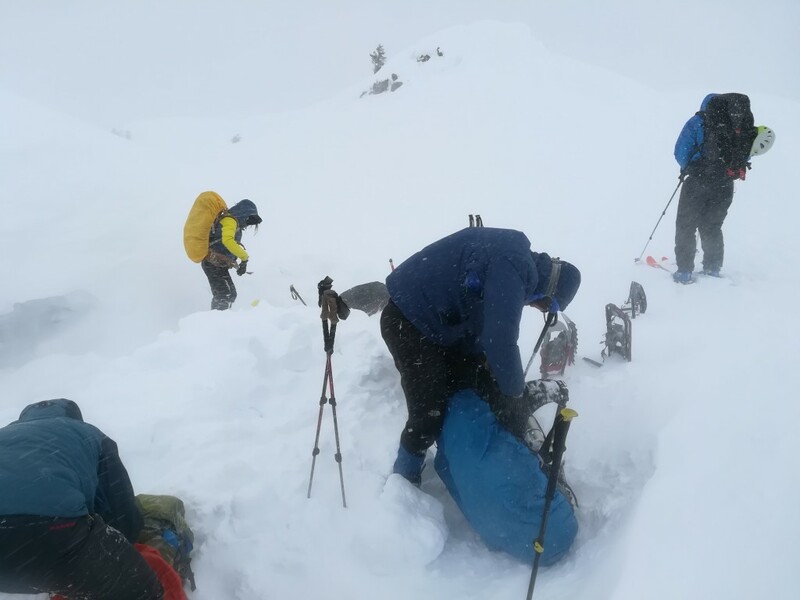 Tons of fresh powder prolonged this ascent from planned one hour to three. Tobias, who announced proudly the optimal choice of his brand new snow shoes earlier, now broke deep into the snow with every step, destroying the nice trail created by the forerunners. So the late guys, Markus and me, had actually to wait an hour for the others until they finally arrived partly exhausted at the hut. It was great to see all this people, now we finally were complete and the trip could start. 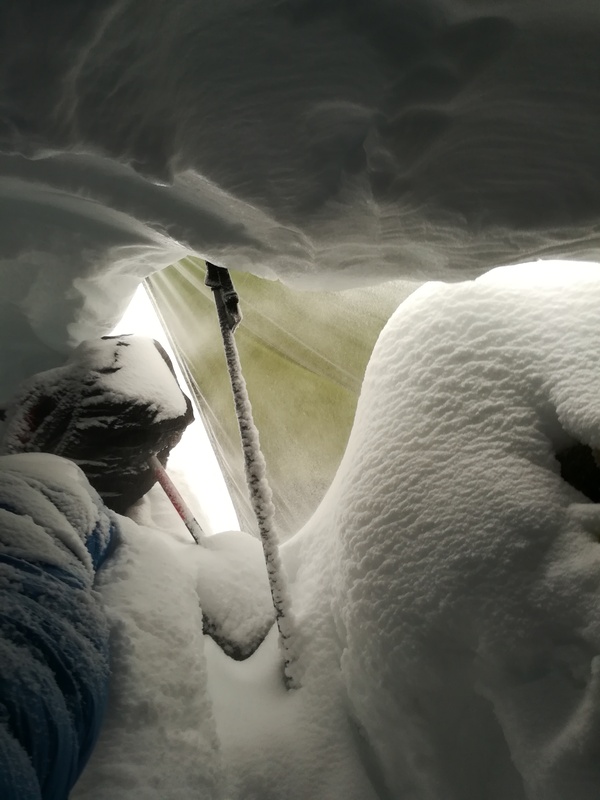 No one felt particularly excited to go up all the way to Rossstock, given the heavy snowing, wind, poor view, and exhaustion from the ascent to the hut. So instead, after one hour of walking we arrived on a small hilly peak called Rossstöckli (Little Rossstock) where we decided to stay for the night. We started digging into a 15m wide and 3m tall snow dune. 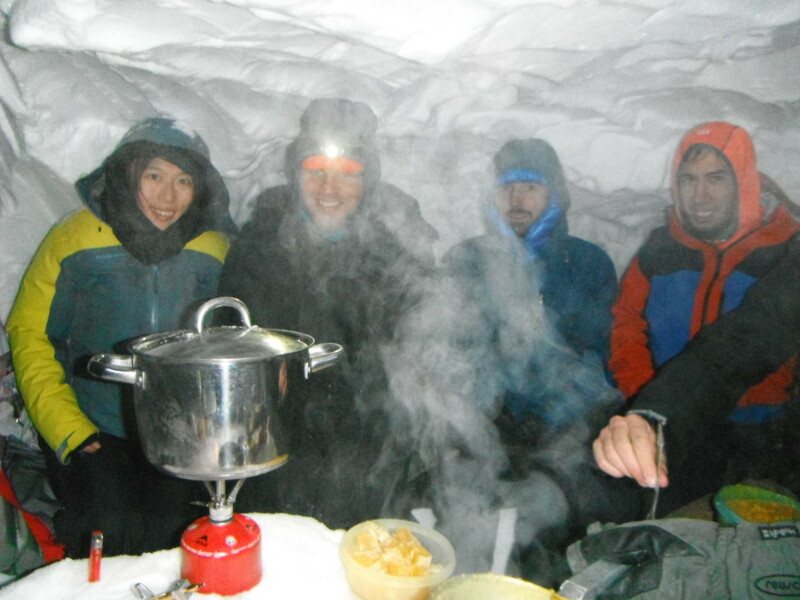 The plan was to dig three snow caves and a luxurious dome-shaped cavern for our feast in the evening. No sooner said, than done. A fun construction site started and strong human snow transportation chains evolved to build our future homes. This peaceful harmony was only interrupted by curses when a shovel worth of snow landed in someone’s necks. A couple of hours later all eight of us were sitting under a snow roof, on a round comfortable bench around the table preparing our meals. A mix of exotic flavors spread in our cavern. It smelled and tasted delicious. The cold creeping up our feet indicated that it was time for candle light and Feuerzangenbowle romance. Wine and rum lit a warm fire in the middle of our cavern and our hearts. Indeed the vapor spread like in a sauna and the feet were warming up, tough not quite as in a sauna. The snow ceiling was slowly getting soaking wet under the steaming pots, and somewhat dangerously lowering itself. 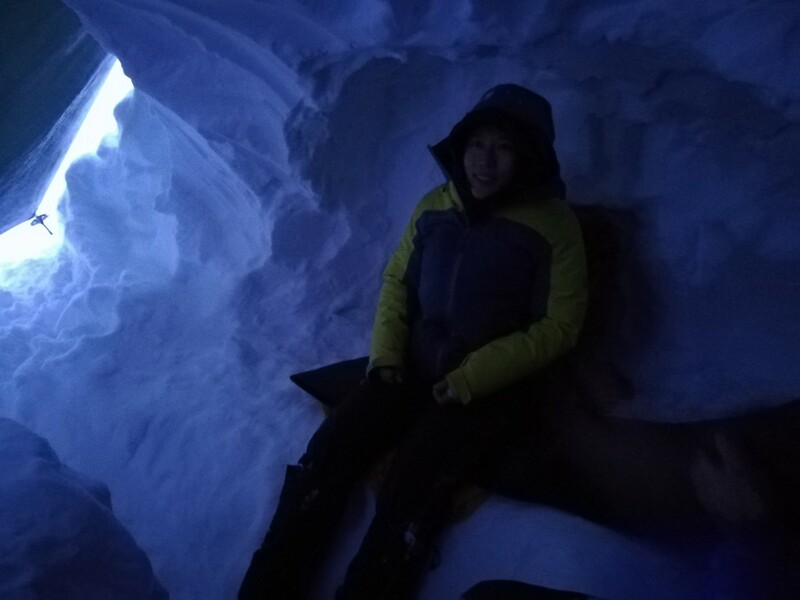 But due to the icy -12°C wind picking up outside the cavern, we decided to stay and spent the evening sharing nostalgic VOC and adventure stories. It was a good evening. Though the ceiling came down quite a bit, we decided that it seems somewhat save that Pascal and me would sleep in the cavern, the others crawled into their caves. Inside, it was warm, cozy and silent. Therefore in the next morning, it took us some time to brace ourselves and go outside. A small surprise awaited us there. A 60km/h blizzard wind blew ice crystals into our faces that felt like lashes on the cheeks. It was hard to bear this, and clear that we would bail. We now also saw the flip side of choosing a snow dune: there was a ton of snow that had blown to our campsite. Checking that everyone was okay, Tobias went to the cavern and the other snow cave… wait, wasn’t there a third snow cave? There was, but its entrance was hard to spot, since it was covered with a meter of wind-blown snow. Luckily, its inhabitants Diego and Isabel were fine, and joined for breakfast after we dug them out. After breakfast, the snow cave entrance was entirely covered again. We started to prepare for departure. Conditions were bad. Strong wind, icy flakes, limited view and there were lots of fresh wind slabs. At least our mood was considerably better and you could still hear lots of laughter. We chose the most cautious route down. Diego did a great job breaking the trail and finding a safe route through the hilly terrain, while Isabel stayed in the back to make sure that we would all go down safely. Arriving back at the forest we enjoyed being protected from the wind and the wonderful trees full of snow. Soon we were back in the bus and train reviewing our adventure. This was an awesome VOC in Europe trip and hopefully not the last one. A lot of thanks to Tobias for organizing and to all the participants for the great adventure, excellent mood and lots of laughter. If you would like to join future VOC events in the Alps, please send an email to tobiask at the domain cs.ubc.ca. 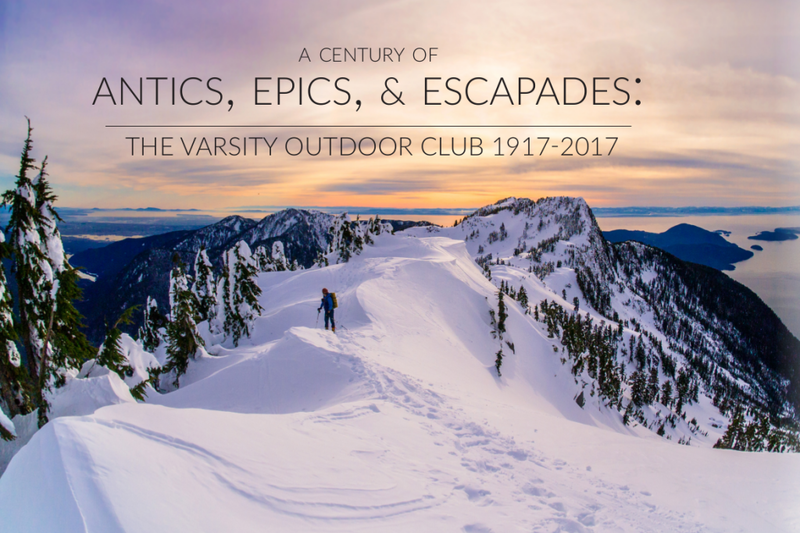 We are already thinking of doing a ski bivy trip over New Years! 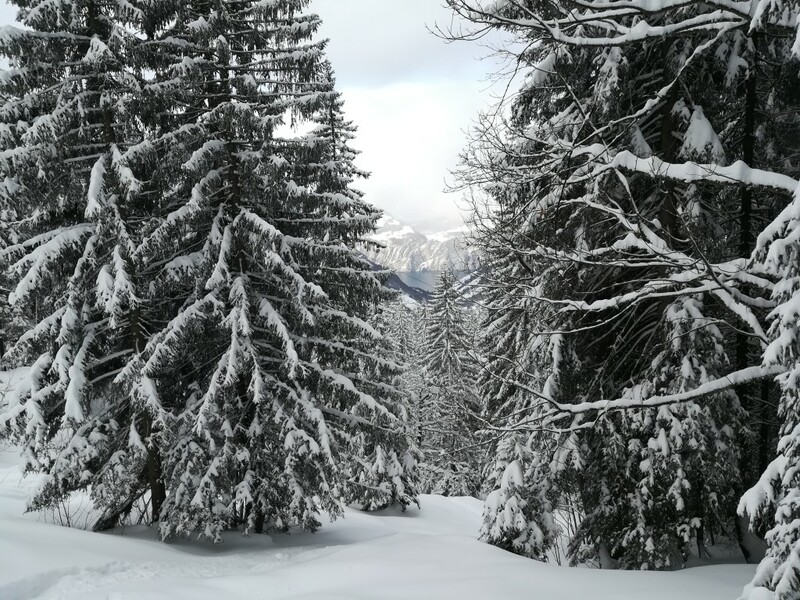 This entry was posted in Ski, Trip Reports and tagged Europe, Feuerzangenbowle, snow shoe. Bookmark the permalink.